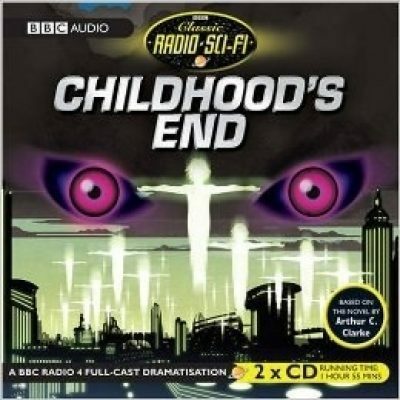 This review was inspired by the news that the Syfy network, perhaps best known for renaming itself after the Polish term for syphilis, had acquired the rights to Arthur C. Clarke’s Childhood’s End . The jury is still out whether the Syfy version will be a full scale abomination, like their adaptation of Earthsea, or merely wretched, like most of the rest of their product. Until the full extent of the horror of this adaptation is revealed, I thought it would be fun to look at—sorry, listen to—a previous adaptation by a considerably more reputable organization with a long history of presenting SF works. I speak, of course, of the two-hour audio adaptation BBC 4 aired back in 1997. As soon as the radio play opens, it is clear that events have developed not necessarily to Earth’s advantage. The frame: a distressed Jan Rodericks reports to an entity named Karellen, narrating the ongoing destruction of the Earth. After the frame has been established, the narrative shifts back some decades to the coming of the alien Overlords. Their arrival coincides with an international crisis of some seriousness. Although they are not yet willing to reveal themselves to humans, the Overlords make their intentions known: they are here to assume control of the Earth. Given the insurmountable technological lead the Overlords enjoy, there is not much humanity can do to resist them. In very short order, human society is reshaped to suit the Overlords. The inevitable attempts to resist are put down very firmly, but without undue bloodshed. Then, the Golden Age! Which, to be honest, appears to be monumentally unsatisfactory from the point of view of humans trapped in an unforgiving world of relentless peace, prosperity, and free expression. While in the early days the Overlords were reluctant to allow freeholds outside their control, they relax their control over humanity as the decades roll on; unfortunately, the pocket utopias set up by various groups do not seem especially effective at producing happiness or fulfillment either. There is far more change to come, as the listener knows from the framing sequence. It might be that that the Overlords arrived during an international crisis, but that appears to be more coincidence than intention. The real reason the Overlords are here is only tangentially connected to our propensity for violence. The real reason has to do with our ultimate destiny. Which gets us back to the eventual sublimation/destruction of Earth. Unsurprisingly, the cast have a range of accents that, while in no way limited to those of the British educated classes, does sound like the result of a London casting call. The play’s attempt at what may have been intended as a Texan accent was bold but fundamentally misguided. It would probably have been better to ask the actor to mimic an accent they could actually do convincingly. Of course, it could have been worse. The British take on American accents was even less convincing a generation or two earlier. This is a rather bloke-heavy cast list, but that’s to be expected. The original book featured many more male characters than female characters. And of course, if the male/female balance in British anthologies and awards are anything to go by, it seems possible that only one or two percent of the British population consists of women. Presumably this would be as true of actors as it is for the general population. It has been a while since I read the original, so this comment may not apply to the novel, but … Karellen is remarkably unconvincing when he outlines the Overlord plan for humanity. Some of this may be due to the fact that he is an alien (d’oh!). He does not know how to lie skilfully, like a human politician, or how to avoid contradicting himself; he and the other Overlords may not know Terran languages all that well (at least in the beginning). Some early scenes, featuring Karellen chatting with the Secretary General, sound as if someone were strangling a squid in the background. My guess is that the odd background noise is Overlordian; either Karellen is using machine translation or someone is by his elbow, giving him suggestions. Not that felicity in translation really matters, since humans cannot possibly resist the Overlords. Still, I do wonder if the Overload takeover was a last-minute decision, which allowed little time for meticulous preparation 1. There are two possible interpretations of this book’s version of the eventual fate of humanity. Optimistic readers may believe that the Overlords are telling the truth about humans experiencing the next step in evolution. Realists point out that the alleged next step is orthogenesist nonsense. If that is the case then the Overlords, who have seen evolution at work on billions of worlds, are lying to humanity. I am firmly in the realist camp. I wasn’t particularly surprised that Tony Mulholland’s script altered the momentous events ongoing when the Overlords arrive (a Soviet/American space race dropped in favour of a more 1997-plausible political crisis; the collapse of the Soviet Union rendered the earlier plot point obsolete). I was surprised by his decision to use Jan Roderick’s narration as the framing sequence. The novel doesn’t immediately reveal that humans are screwed (I’m in the realist camp, you will recall), whereas the radio play makes that obvious from the beginning. It is a very dramatic difference between the two versions of the story. The 1997 radio play is a perfectly acceptable adaptation; it takes some liberties with the original, but I can see why those particular changes were made. It didn’t blow my mind the way the original book did. But when I heard the play, I was older and less easily awed. The BBC adaptation can be acquired here. A: The great transformation occurs about 130 years after the Overlord’s arrival. B: The Overlords’ nearest base is some 40 light years away. The Overlords have starships that can travel at close to light speed, which means that the time it took the first mission to just reach us was close to a quarter of the time the Overlords spent overseeing the human transition. There’s very little leeway for scheduling error. To me, that lack of leeway suggests a rush job, that the Overlords weren’t aware of us until shortly before they dispatched that first mission.